We are sitting pretty at the start of the summer, and some of you might be curious which flowers are best suited for this time of the year. Many flowers have a strong seasonal or cultural relationship with a particular month of the year, and you can make the perfect floral arrangement with knowledge of the best flowers for Summer. The flower that is so similar to the appearance of the blazing July sun was named rather accordingly. No summer flower arrangement is truly complete without the presence of a few sunflowers to accentuate their warm colors. 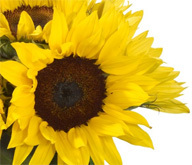 The sunflower is another popular addition to a July wedding floral arrangement. Carnations are popular decoration flowers for July 4th, when Americans show their patriotism and make arrangements of flowers dyed red, white, and blue. Carnations come in an enormous variety of colors, and you can be sure to find just about any color to match your July floral arrangement. Carnation blooms last for a very long time even after they are cut, so these July flowers will likely last long enough to become August flowers. 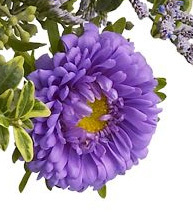 The aster is known as one of the better July wedding flowers, as they start blooming in the summer and last through the fall season. These plants thrive in full sunlight, and if pinched back in mid-July, they bloom much heavier and have stronger stems. They are one of the easiest perennial flowers to cultivate during the summer, and make good cut flowers. 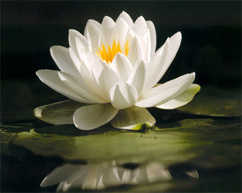 The alternate July birth flower is the Water Lily. The Water Lily is rooted in soil, but grows and floats in lakes and ponds with the leaves and flowers visible at the surface. The Water Lily makes the mind remember the summer sensation of going to the lake or swimming like the flower naturally does. They make great ornamental flowers for the home in July. The Larkspur is widely known as the "July flower," and is also the birth flower for the month. This definitive July flower is associated with lightheartedness, levity, open heart, and fickleness. Larkspurs remind us of the carefree days of the summers of our youth, and are excellent cut flowers for a summer floral arrangement. Colors can include purple, blue, red, yellow and white, making for an elegant summer color spectrum. Larkspurs are also perfect gifts to give anyone who has a birthday in July. These beautiful summer flowers are found in warmer regions of the southern United States, thriving on the July heat in the hottest region of the country. 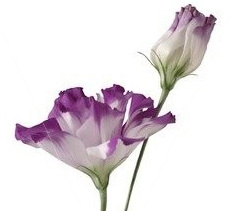 Lisianthus are very long lasting flowers and include colors such as white, lavender, shades of pink, purple, and combinations such as blue-voilet. They have very long stems to give some height variety to your floral arrangement. 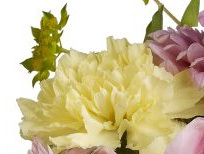 Lisianthus flowers are excellent as ornamental flowers, potted plants, and cut flowers.